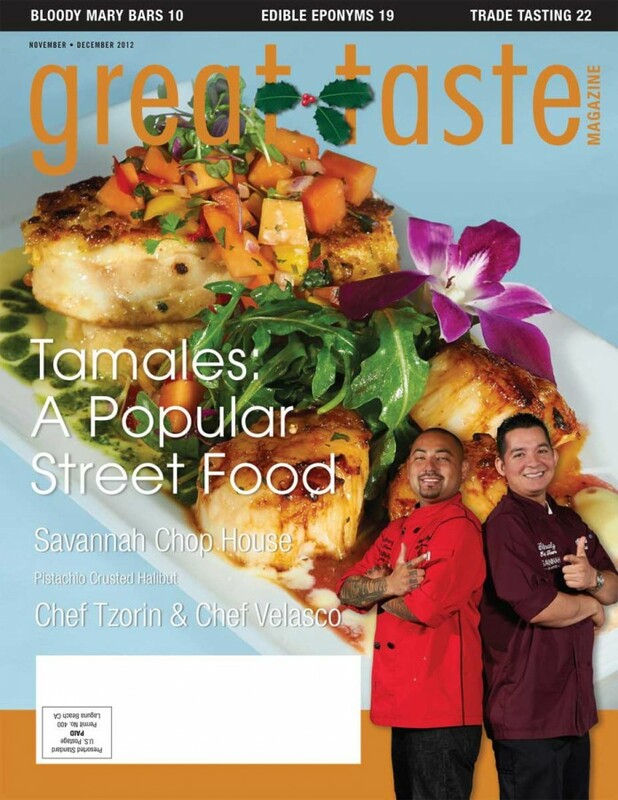 Great Taste Magazine Nov Dec 2012 Issue features Chef Chris Tzorin and Chef Manny Velasco with culinary news, tips, recommendations and recipes from OC chefs. With the holidays quickly approaching, there are lots of presents to buy. One way to eat great and save is to conduct research on the daily promotions offered by restaurants. With extra cash in the bank, buy Chef Roberto Santibaez new book Tacos, Tortas, and Tamales. Flavors from the griddles, pots, and street side kitchens of Mexico as a gift for the culinary enthusiast in your circle of family and friends. Another popular gift that never goes out of fashion is chocolate. This season purchase from Luisa Chocolatiere. The shop is salient in the Laguna Hills community and the product is well known for its prestigious quality. If cooking is an expression of love from the heart, make a pie using Rouge Vif D’Etampes (Cinderella Pumpkin); Great Taste Magazine’s Produce Pick of the Month. Di Stefano Ricotta Cheese reigns supreme as the Cheese Pick of the Month . As the end of the year rapidly approaches, is work becoming stressful? Follow the trend and bartend your own Bloody Marry at 3 Thirty 3 Waterfront in Newport Beach. Or have one at home while biting into the Mayan rudiments. Tamales are traditional comfort food. Chefs Chris Tzorin and Manny Velasco of Savannah Chop House in Laguna Niguel are eagerly anticipating volumes of company parties and banquets to cater. Know how your favorite meal or produce got its name? Do a google search and find out! For example Hass Avocado derives from 1935 La Habra resident Rudolph Hass and his experimentation with cross-pollinating avocado seeds. Next time you’re at a restaurant, observe if music lingers in the background. Music can bring forth a good vibe and can be tailored to the shop’s menu, mood, and motif. The motif at a Trade Tasting event is to explore wines. Here are some Do’s and Don’ts. Do eat a large breakfast or lunch to avoid becoming a drunk buffoon.Don’t feel the need to stay the allotted time. Happy Holidays from Great Taste Magazine!